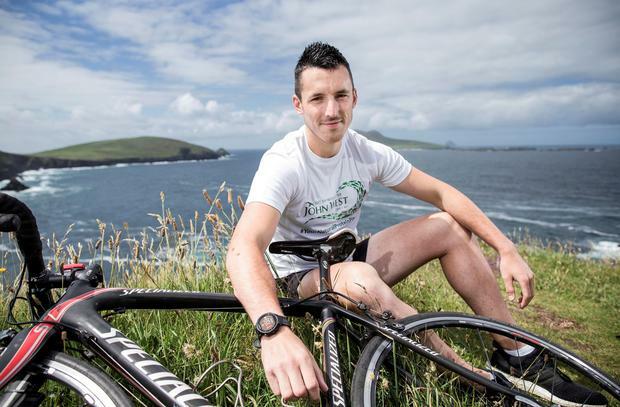 Dingle ultra runner Shane Finn who will be completing a coast-to-coast run and cycle across North America in 36 days, inspired by the bravery of his cousin. 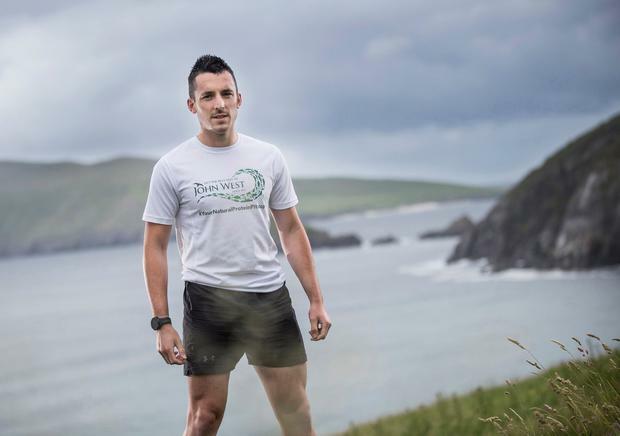 Kerryman and ‘ultra’ athlete Shane Finn is embarking on a gruelling 5,000km coast-to-coast trek across North America in a charity mission inspired by his cousin. Shane (26) from Dingle will begin the epic run and cycle on San Francisco's Golden Gate Bridge on March 29 and take him across 12 states and terrain that varies wildly, from snow-capped mountains to arid desert. Starting with a 270km three-day cycle, followed by running 60km for three consecutive days, the 26-year-old 'ultra' athlete will repeat that pattern six times on his 36-day trip. The journey will finish as he runs across the Brooklyn Bridge in New York on May 3. There to meet him, on her very first visit to the States, will be his cousin Mary Evans, the inspiration for his amazing feat of endurance and philanthropy. The 37-year-old Celbridge woman is living with Spina Bifida and Hydrocephalus and this is not the first time he has shown such altruism. “Mary's daily struggle inspired me to run my first marathon at 17 when I raised €8,000 and, more recently, to complete 24 marathons in 24 days, which raised €142,500," Shane said. “Mary and her family used to come down to us for holidays but, at one point, when her condition deteriorated they had to re-model their house in Celbridge so she moved to West Kerry for a while. “That's when I first realised that her condition is non-stop. “I might be in some pain out on a run but Mary feels pain 24 hours a day. That's why I picked 24 marathons in 24 days. “People said 'you did this amazing thing' and I was thinking 'but it was just 24 days!’ Mary is 37 so she's been fighting, 365 days a year, for 37 years. He hopes that his American Ultra odyssey will raise €250,000 for Spina Bifida Hydrocephalus Ireland (SBHI). “This will ensure that essential respite services for over 100 children, teens, and adults can continue. The young entrepreneur is already in San Francisco putting the finishing touches to his training and logistics after a week's altitude training in Boulder, Colorado. His gruelling adventure will be documented in a film thanks to support from John West, corporate charity partners of Spina Bifida Hydrocephalus Ireland. “There's a lot of unknowns in terms of terrain and weather and I think that's probably worrying everyone else, but that's actually what excites me. That's part of who I am,” said Shane. “My biggest worry would be falling asleep on the bike or crashing, things out of my control." Shane will be accompanied by a small voluntary support crew of his dad Tim, physio Ali McCann, driver Martin Fahey and fellow Dingle native Anthony O'Gorman, who will all travel and live in two camper vans for the month-long trek. Two bikes, with three different saddle types to help ease his aches, form part of his equipment and he will need to eat 8,000 calories a-day for his massive endurance challenge. The John West-backed film, made by Craig Kenny and Ben Condell who filmed 24 Marathons in 24 Days, aims to give viewers an insight into every step and revolution of Shane’s arduous journey. “Shane has been our spokesperson on a number of sports partnership activities as part of our support of Active Healthy Lifestyles and has inspired us to be with him every step of the way,” said Peter Rooney from John West. You can support Shane’s American Ultra challenge for Spina Bifida Hydrocephalus Ireland at www.americanultra2019.com and follow his progress on the John West social media channels.